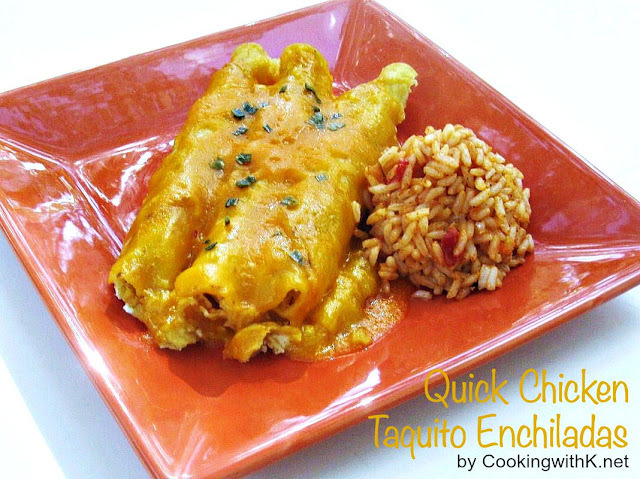 When you are looking for a quick dish to take to a gathering or just make for yourself in a hurry, you are going to want to make these Quick Chicken Taquito Enchiladas. The recipe comes from a dear friend of mine who is a wonderful cook and who has her own repertoire of her signature dishes that are out of this world. There are endless possibilities to what kind of cheese you like on them to what kind of toppings you like. Thank you Brenda for sharing such a great dish, and as always, we will be making these during the holidays! Line the bottom of a large baking dish with the taquitos in a row. In a medium bowl, mix sour cream and chicken broth together with wire whisk until smooth and creamy. Pour over taquitos. Top enchiladas with cheese. Bake in a 350 degree oven for 20-30 minutes or until cheese is bubbly. Garnish with green onions or jalapenos. Cook's Note: If you like more sauce, just increase the broth and sour cream. Brenda says she also adds a can of cream of mushroom soup too. Hi I'm a new follower from Petite Hermine's Linky Party. Looks like something my grandkids would like.